Volunteers needed after ceremony to place wreaths on veterans' graves. For more information on WAA please contact our local Wreaths Across America Leader Mel Harbaugh at (419) 346-9192 or Find us on Facebook Wreaths Across American Toledo Area Metro Chapter. We take our mission seriously: when you donate to WAA, your money sponsors a wreath first. $.086 of every dollar donated goes toward wreath sponsorships, shipping costs not covered by our trucking partners, and fundraising group paybacks. WAA operates on the remaining margin, keeping overhead low and paying wages to just 8 full-time employees: our Executive Director and Chairman take zero salary and are 100% committed to the mission. 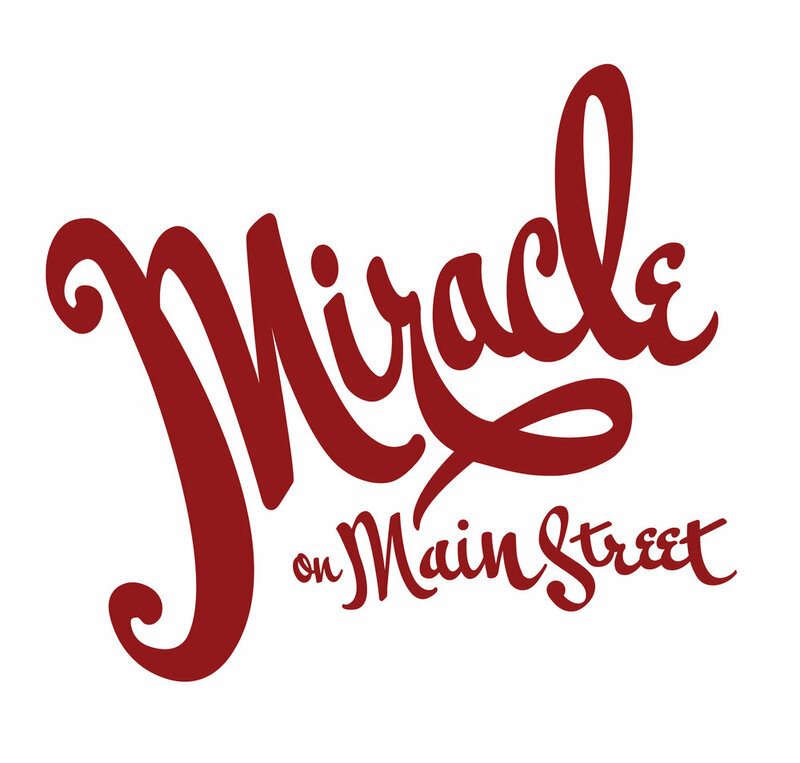 This year we are inviting everyone to Miracle on Mainstreet in downtown Sylvania. Please join us by participating in our 9th Annual Memorial Tree Lighting Ceremony. The first 300 people will receive a holiday tree ornament to be placed on the City of Sylvania’s Tree, located in Sylvania’s Historical Village. Mistletoe Market located on Maplewood Ave, will begin at 5pm featuring local crafters and vendors. The Red Bird Art Walk will also be happening; galleries, boutiques, restaurants, live music, bakeries, salons and much more will highlight all that downtown has to offer! Deck the Halls for History at Sylvania Historical Village will open at 5pm-8pm, Toledo Memorial Park Tree Lighting will begin at 5pm for ornament decorating, Sylvania Choir starts at 5:15pm, Mayor & Town Crier say a few words, Lighting of the Tree 6:30pm. Parking will be in city lots. The holidays are a time for family, friends & memories. Help us welcome the community to participate in this memorable tradition that allows us to remember friends & family that will be missed this year. 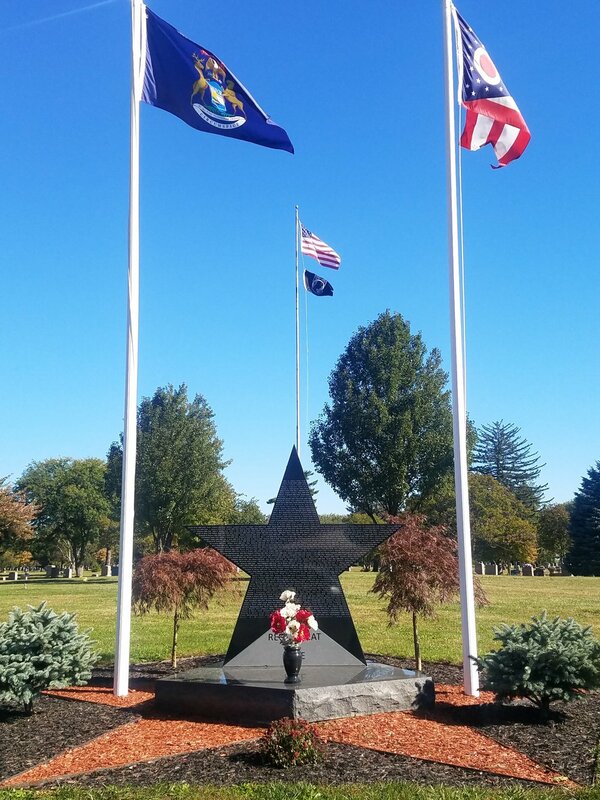 A star shaped memorial tablet of black granite, engraved with 323 heroic names of soldiers, sailors, marines and nurses from Lucas County Ohio, will be set near the Veterans Tower at Toledo Memorial Park. These men and women who gave up their lives for their county during WWI now have a permanent forever place. In the early 1920’s a tree was planted in memory of these brave men and women and a bronze marker was set at the foot of every tree. Over 300 trees and markers lined the 2.5 miles of Memorial Way and throughout the cemetery, paying tribute to the over 300 men and women. Decades later most of the bronze markers became overcome by the growing trees. Benjamin Gerken, of the Grounds Crew at Toledo Memorial Park, noticed some of the dilapidated markers. After months of researching and help from a woman in our office and Boyd Montgomery, a Board Member at Toledo Memorial Park, he was able to find the original newspaper clipping from 1926 detailing the events. He then set out to rescue all of the markers, which in some cases took digging, jack hammering, and metal detecting to find and recover. We will be dedicating the memorial November 11th 2018 @ 11am, symbolizing the end of WWI 100 years ago on November 11, 1918. Girl & Boy Scouts of Northwest Ohio are having their Second Annual Trunk or Treat Event! Donation of canned foods in order to participate. All donations will be given to Veterans Matter, to feed the hungry vets of Toledo. How it works: Children and their families will go car to car to get treats! Registration is mandatory include the following: your business name, organization name and troop number. Bring Plenty of candy, there were over 1,000 trunk treaters last year! Please make sure there is someone passing out candy at your trunk at all times. All organizations are encouraged to participate! Spread the word about your business!! Bring your friends and family for a slow roll ride through Toledo Memorial Park, scenic Sylvania Neighborhoods, and Olander Park... all under the stars! Then join us for a casual affair with food trucks, craft beer and live music. The 9.4 mile ride will begin at Spoke Life Cycles (6363 Monroe St). Parking will be available for riders at Root Inc (5470 Main St) or St. Joe's (5373 Main St). The route will conclude at Richard Becker Place, behind Fuller Art House (5679 Main St). Ridin' Late is a family friendly ride. Riders should plan on biking for approximately an hour to cover the 9.4 mile route (8-10 mph). Since this is a twilight ride, riders will be required to have both a headlight and a tail light on their bicycle. Riders will also be required to wear a helmet. Lights are available for purchase when registering or at Spoke Life Cycles. Each registered rider will receive an event t-shirt. Afterwards at the After Party, enjoy live music, local food trucks and craft beer under the stars with other bicyclists. Complimentary bike parking will be available. Over 200 riders joined us at Ridin' Late in County 48 in 2017. Ridin' Late donated over $500 in proceeds to Safe Kids Greater Toledo. Funds were allocated for bike safety equipment. Safe Kids participates in many safety events around the metro Toledo area, such as bike rodeos, bike safety education, helmet fitting events and Bike to School Day. We've partnered again this year with Brightz, Ltd, a local company that specializes in battery-powered LED light accessories for bicycles. Brightz will be providing their revolutionary bike lights to the first 300 riders to create a colorful spectacle along the route. Brightz lights will fit any bike, require no alterations or special fittings, and can be installed on the fly the night of the ride. Brightz lights are considered an accessory and all bicycles will still be required to have headlights and tail lights. Once your registration is complete, you will receive a confirmation e-mail. Details about Packet Pick-Up will be included in your confirmation email. Present confirmation e-mail at Check-In on the night of the ride. You may also register in-person at Spoke Life Cycles on the night of the ride from 6 PM to 7:30 PM. We hope to see all of our classic car friends and fanatics at our Annual 2017 Car Show to support Wreaths Across America. Mark your calendars for the upcoming wreath laying ceremony December 16th 2017 at Toledo Memorial Park Cemetery & Mausoleum. Toledo Memorial Park is the starting point for the annual Memorial Day Parade and we can't be more excited and honored. The ceremony begins at 9:00 am at Veterans Memorial Tower here at Toledo Memorial Park. After the ceremony, visitors head to Main Street to view the parade, which begins at 10:15 am at St. Joseph Church. At 11:15 am, Memorial Ceremonies will follow at Veterans Memorial Field. Please view the agenda and map for more details. We look forward to honoring the lives of over 14,000 Veterans at rest in these hallowed grounds and the lives of all who gave the ultimate sacrifice. Spring and early summer are one of the most beautiful times of the year to visit with our many tulips and flowering trees coming into full bloom. The over 12,000 American flags decorating the graces of our fallen heroes over the Memorial Day weekend adds to the beauty of the cemetery. Please join Toledo Memorial Park on Wednesday, May 23rd, Thursday, May 24th and/or Friday, May 25th. for our Annual Flag Placing event. Every year, volunteers from Sylvania and the surrounding areas come out to make sure no solider is forgotten this Memorial Day. They take the time to give back and help pay tribute to our Veterans. Please call Jim Lyell for volunteer information at 419-356-5378. Spring time is a time for family, friends & memories. With this in mind, we' like to take a moment to share in remembering our mothers (or other loved ones) who will be missed this year. Long sleeve T-shirts will be available for purchase at the end of April. You will be able to reserve yours online or at the office, check back for more details. Pre-registration will be available online starting in April. Check back for more details. For more information on WAA please contact our local Wreaths Across America Leader Mel Harbaugh at (419) 346-9192 or email at WAATMAC@gmail.com. The holidays are a time for family, friends & memories. With this in mind, we'd like to take a moment to share in remembering those friedns & family who will be missed this year. Please join us by participating in our 8th Annual Memorial Tree Lighting Ceremony. You will receive a holiday tree ornament to be placed on our tree in honor of your loved one. Light refreshments will be served. Pre-registration is now CLOSED click the button below for more information. Annual 911 ceremony presented by The City of Sylvania. Sunday, September 10th 11am-5pm Unmolding Party - Take a turn smashing the mild! Join us for the the dramatic moment when the bell is carefully removed from its mold and polished. Be there for the Last Call Bell’s special dedication ceremony and hear it ring for the very first time. Pouring of the Bell, you can help cast the bell!! Join us for the casting of a custom bronze bell to honor fallen police and fire personnel. Join our “ingot brigade” and help load 500 pounds of bronze into a furnace for the casting of the bell. Mini F-16 get your picture taken! Verdin’s Bell Foundry on Wheels, this two-day event offers the community an up-close personal experience in the creation of the last call bell which will forever be located at Toledo Memorial Park’s 911 First Responders Last Call Memorial. The ringing of the bell is a tradition that has been done for over 200 years at firefighter funerals, it signals that he/she has come home for the final time. Casting the bell takes hundreds of pounds of bronze known as ingots, we invite the community to take part in the “ingot brigade” loading bronze pieces into the furnace. Click here to learn more about Verdin's traveling foundry. Take a turn smashing the mold!! Bring your friends and family for a slow roll ride through Toledo Memorial Park, scenic Sylvania Neighborhoods, on the Sylvania River Trail and through Pacesetter Park- all under the stars! Then join us for a casual affair with snacks, cold drinks and craft beer from 9:30pm to 1:00AM. The 13-mile ride will begin at Spoke Life Cycles (6363 Monroe St). A family-friendly 3-mile route is also available. Parking will be available for riders at Root Inc (5470 Main St) or St. Joe's (5373 Main St). The After Party will be across from the designated parking lots at 5445 Main St. Since this is a twilight ride, riders will be required to have both a headlight and a tail light on their bicycle. Riders will also be required to wear a helmet. Lights are available for purchase below when registering or at Spoke Life Cycles. Each registered rider will receive an event t-shirt. The route will conclude at the River Centre Foundation (5445 Main St) and complimentary bike parking will be available. Enjoy snacks and craft brews under the stars with other bicyclists. We've partnered with Brightz, Ltd, a local company that specializes in battery-powered LED light accessories for bicycles. At the 2017 Ridin' Late in County 48 Event, Brightz will be providing their revolutionary bike lights to the first 300 riders to create a colorful spectacle along the route. Brightz lights will fit any bike, require no alterations or special fittings, and can be installed on the fly the night of the ride. Brightz lights are considered an accessory and all bicycles will still be required to have headlights and tail lights. Once your registration is complete, you will receive a confirmation e-mail. Details about Packet Pick-Up will be included in your confirmation email. Present confirmation e-mail at Check-In on the night of the ride. You may also register in-person at Spoke Life Cycles on the night of the ride from 7 PM to 9 PM.